Finland experiences long and harsh winters. Days are short and in the northernmost parts of the country, temperatures can drop as low as 50ºC below zero. When weather conditions get tough, solutions have to get creative. Finnglass has more than 30 years of experience in providing innovative, custom-made structural glass façades and window solutions suitable to withstand frigid climates with its leading-edge innovation – electrically heated glass. 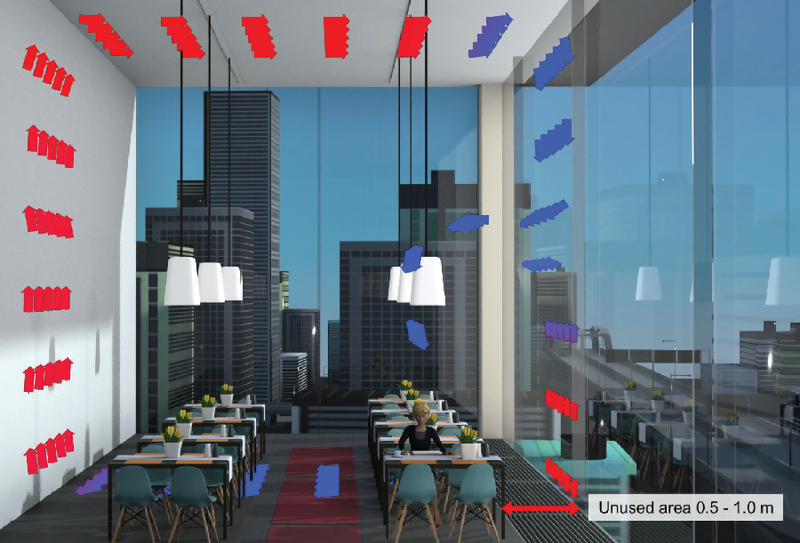 Electrically heated glass eliminates the uncomfortable ‘cold wall effect’ causing convection and manifested by draft and cold radiation experienced when close to traditional, non-heated glass walls and windows. It provides an energy efficient way to enhance comfort and utility of indoor spaces by eliminating space-consuming heating devices, such as radiators or fan coil units, usually installed all along the base of glass walls. Removing such devices releases space for operations, which can be used for workspace in offices or more tables in restaurants. 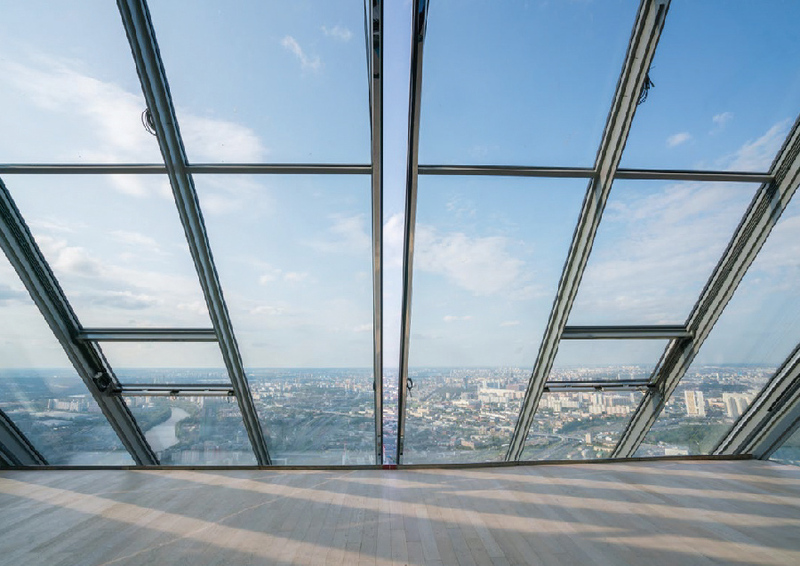 Heated glass can cut down construction costs of new buildings and offer energy efficiency and a modern look to old buildings. Before getting technical about how these can be achieved, let’s look at how this technology has benefitted real-life projects. The glass igloos at Kakslauttanen, Finland, are a prime example of how Finnglass helped a Finnish entrepreneur realize his vision of transparent accommodations to drive tourism for the northern lights above the arctic circle. Finnglass manufactured electrically heated glass panes mounted on tailor-made steel frames to achieve unobstructed views of nature while providing the utmost comfort. Before finding the perfect solution, we considered insulated glass without heating and insulated glass with electric heating only on the interior glass, but both had their problems. With insulated glass without heating, water condensed on the glass, froze and collected snow on the outside. In addition, glass radiated cold inside and did not provide sufficient comfort. When we added heating on the interior glass, we achieved comfort, but the outside surface of the glass globes still had to be brushed and scraped manually, which would have generated labour costs and breached the privacy of customers inside igloos. The perfect solution was found in installing electric heating on both the interior and exterior panes of triple-glazed glass. This way we achieved comfort indoors and had snow and ice melt on outside surfaces. The interior glass is heated to just one or two degrees higher than room temperature, eliminating all sensation of the cold wall effect. Thanks to smart sensors, heating on the exterior glass is on only when it snows, making it energy efficient and highly reactive to changing weather conditions. Electrically heated glass is the only architectural solution that can prevent condensation and convection, provide unobstructed views at all times, and maintain customer comfort even if the outside temperature drops 15 degrees in less than an hour. Construction costs increased with the use of heated glass, but the investment paid back within a year thanks to the international attention brought by incredible comfort in arctic conditions that in the end, led to a new, very profitable business. Pictures of the arctic resort have been viewed online over a billion times. Josef Gartner GmbH (a Permasteelisa company) contracted Finnglass to manufacture glass for Mercury City Tower’s crown. 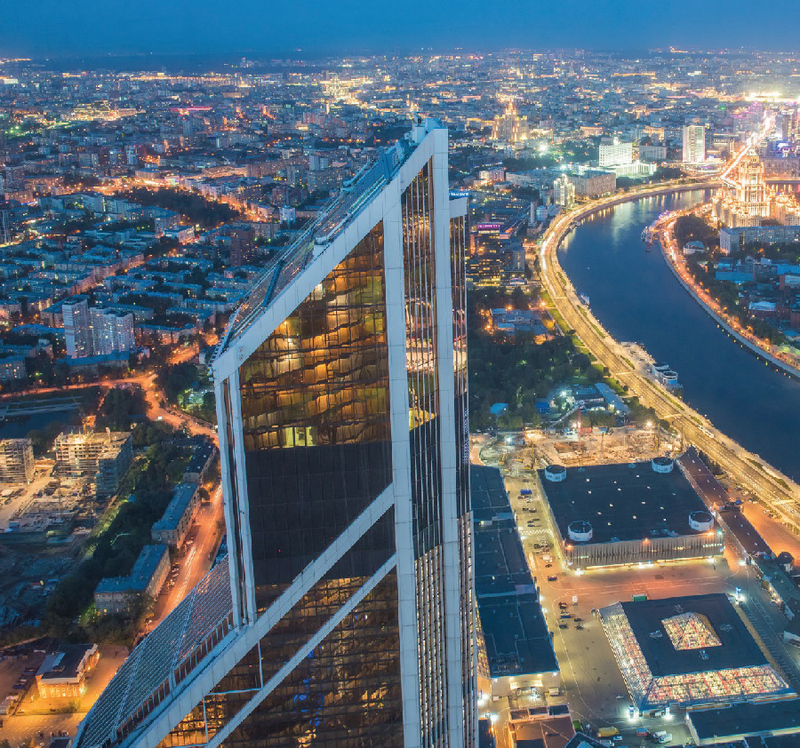 At 338 meters, it is the second-tallest skyscraper in all of Russia and Europe, situated in Moscow. Sloped roofs at lower levels were built by Yuanda, also using Finnglass products. Once again, the cold climate played a role in challenging energy efficiency, indoor conditions and health and safety. Weather conditions called for heating on both interior and exterior glass, which Finnglass provided to meet requirements. Electrical heating on the interior glass brought incredible comfort indoors from glass wall to glass wall. It optimized the utility of indoor space without the need for additional space-consuming radiators or fan coil units in proximity to the glass to prevent convection. When constructing skyscrapers in cold climates, the prevention of ice and snow build-up on rooftops is crucial in ensuring the safety of all people around. Snow and ice must be melted with heating on exterior glass to prevent it from falling to street level from over 300 meters above. We built roofs with sensors to detect snowing, which turned the heating on to melt snow. Water from melted snow and ice is directed to gutters, also featuring heating, to ensure that water gets all the way down without freezing on the way, blocking passageways. Since the heating is on only when it snows, costs are minimized, windows are kept unblocked, and daylight gets in. Electrically heated glass differs from normal glass both in structure and features. In the example provided, the window consists of two tempered glass panes with the interior glass installed with heating. However, heating can also be installed on the exterior glass, or even both, depending on customer requirements, climate and conditions. 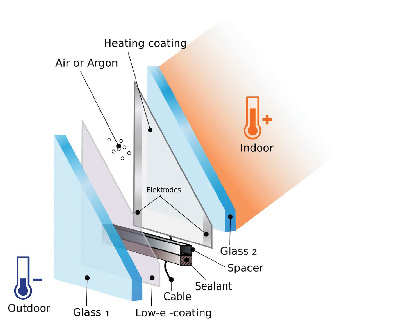 Both glass panes feature low-E coating, but in the example, only the interior coating is connected to electricity, making it a heating coating. Low-E coating acts as a uniform resistance element warming glass evenly all across the pane. The second low-E coating on the exterior glass reflects escaping heat back towards the indoor space. 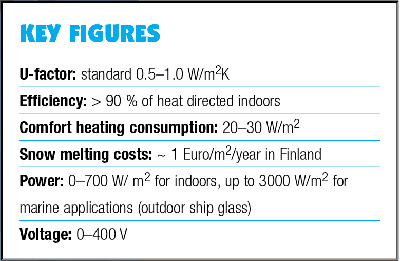 According to a study by the Technical Research Center of Finland (VTT), 100 per cent of electric power is converted to heat when using heated glass and over 90 per cent of it can be directed indoors, making heated glass superior in efficiency to any other system or technology. The edges of the interior glass panes have electrode strips, which lead electric current from a highly flexible double-insulated cable to the heating coating. The glass panes have air or argon in between and are held together with a sealant. Standard polyurethane sealant is used for glazing window solutions, and silicone sealant for structural glazing. The use of point fixations is also possible for structural glazing. 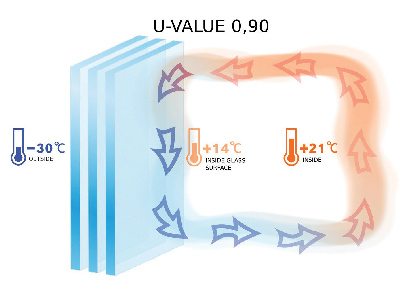 With Finnglass’s cutting-edge technology, even shaped glass can be installed with heating to warm uniformly without transformers, saving on investment, usage and energy costs. 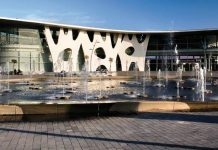 Finnglass has over 30 years of experience in developing and manufacturing electrically heated glass for structural glass façades and window solutions to achieve comfort and beauty in the face of the most challenging climates and conditions. 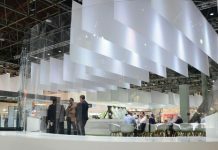 The company believes that the highest value is achieved by innovating radically new solutions based on client needs, including leading glass and metal contractors around the world. Finnglass’ vision and values are driven by quality, assured by maintaining both product design and manufacturing at its premises in Finland. Technical solutions are designed and tested using unique simulators and highly advanced analysis tools developed in collaboration with leading universities. To heat glass just enough to prevent convection and cold-wall effect consumes only 20 to 30 Watts of energy per square meter of glass. When convection and cold radiation asymmetry are eliminated, the room temperature can be lowed without compromising comfort. We showcased increased comfort with our cold wall effect simulator at Glasstec 2018. Visitors were astonished at the incredible difference in comfort when standing next to heated glass with a U-factor of 0.5, compared to normal insulated glass with the same U-factor. Another typical problem is condensation, or the formation of water, on the surface of glass. The key here is to warm glass right above dew point. When heating is installed on the exterior glass, it prevents condensation, ice formation and snow build-up. When heating is installed on the interior glass, it can be used in humid environments such as swimming pools to prevent condensed water from leaking into the structures, causing damage. Having heating directly on the surface of glass eliminates the need for other heating devices aiming at preventing convection and freezing, such as radiators or fan coil units. 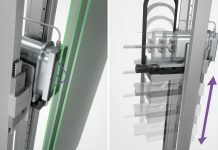 These heating devices are usually installed at the base of glass walls and take up between 0.5 and one meter of space all along the length of a glass wall. With heated glass, you eliminate having to build extra space for fan coil units, which can lead to substantial savings in construction costs. These cost savings in constructing new buildings more than make up for the initial investment in heated glass. Alternatively, in old buildings you can remove fan coils and enjoy more operational space. For commercial spaces, this means additional workspace in offices and more tables in restaurants.